Are you see error or crash in Microsoft Office 2007? Try this methode to diagnose and repair the error or crash in your Microsoft Office. 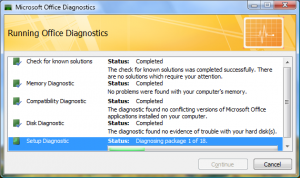 To diagnose crashing Ms Office 2007 can use Microsoft Office Diagnostics. This features included with Microsoft Office 2007. Open diagnostics tool from start – All program – Microsoft Office – Microsoft Office Tools then selec Microsoft Office Diagnostic or If you open one of the microsoft office 2007 program (Excel, Word, Access, Power Point) Click the Microsoft Office Button, and then click Program Name Options (e.g for Ms Word Click Word Options or for Excel click Excell Options) then click resource then click diagnose. 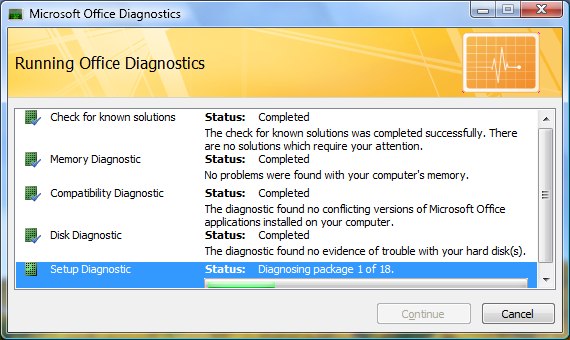 click Continue, and then click Start Diagnostics to diagnose the error. If found error in microsoft Office 2007 will be repaired automatically. Related to "How to Know and Repair Error in Microsoft Office 2007"